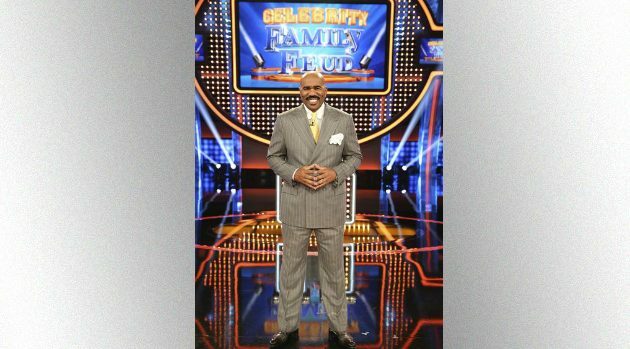 “Celebrity Family Feud” Host Steve Harvey; ABC/Adam TaylorThe third season of ABC’s Celebrity Family Feud returns June 11 with a host of new guests, including some very notable recording stars, playing with their families for their favorite charities. Christina Milian and her mother, father and two sisters, playing for Hands4Hope LA, will go up against comedian Louie Anderson and his family in one episode. In another episode, Grammy-winner Faith Evans and her brood, playing for Pacer, will face off against E! Red Carpet host Ross Mathews with several members of his family and a friend. Kandi Burruss, her husband Todd Tucker, her two aunts and her mother will be playing for her Kandi Cares charity. They’ll face off against fellow Housewives of Atlanta star Cynthia Bailey and Bailey’s mother, sister, daughter and niece, who’ll be playing for Toys for Tots. Meanwhile, Terry Ellis of En Vogue will team up with Cheetah Girls Kiely Williams and Sabrina Bryan, Pussycat Dolls creator Robin Antin and Carnie Wilson of Wilson Phillips as an epic Girl Group team playing for Girls Inc.
Their rivals will be a Boy Band team made up of Nick Lachey of 98 Degrees, NSYNC‘s Joey Fatone and Chris Kirkpatrick, Howie Dorough of the Backstreet Boys and Boyz II Men‘s Nathan Morris. Each team has the chance to win up to $25,000 to donate to a charity of their choice.